of the weekend I knew I’d never keep bees in it. honey and comb in its purest form. can not only hear but smell the hive, a warm heady mix of honey and wax. 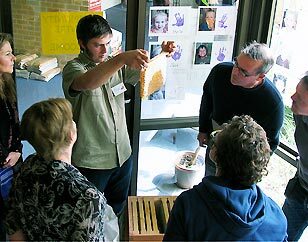 Between 2009 - 2017 we taught dozens of two day ‘Natural Beekeeping Courses’ across NSW. From 2018 onwards we will be replacing the two day course with different types of one day Warré beekeeping course. (more details and booking information can be found below). 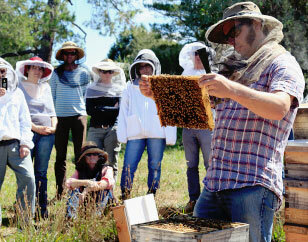 This course covers the basics of natural, organic, biodynamic, small-scale and bee-friendly beekeeping. keep your own bees, Warré style! 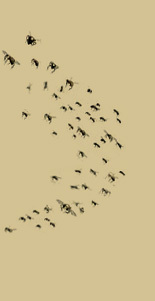 in healthy contented bees and incredible wild honey. amazing biology of the honeybee superorganism. Approximately 80% of the course is class-room learning and discussion with the remaining 20% spent outside during the hive opening session. 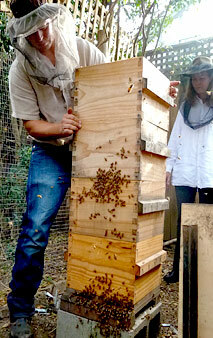 using natural beekeeping principles in another hive design. some of the knowledge you have already acquired through actively keeping bees. 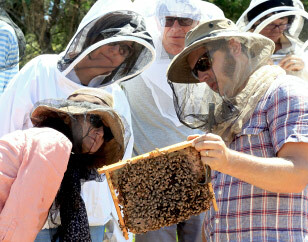 This course is 50% classroom learning and 50% hands-on learning in the apiary. Students will have the opportunity to form small groups and interact practically with the Warré hives on-site so please bring your beekeeping gear! Our courses are professionally run, featuring a series of presentations covering many topics including bee biology, natural beekeeping philosophy, apicultural history and the myriad of technical and practical aspects of keeping bees. to provide visual detail to increase student learning. is structured to meet the needs of students from varying backgrounds and with different levels experience. along with a copy of David Heaf’s book,Natural Beekeeping with the Warré Hive: A Manual (Stage 1 only). 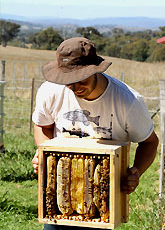 He has many years of experience with natural beekeeping in different climates across Australia and his methods and ideas have been featured in a number of international beekeeping journals. Tim's background as a 2nd generation beekeeper and a beekeeping assistant in his father’s commercial organic Langstroth apiary of 1,000 hives gave him a solid grounding in the practical aspects of apiculture. 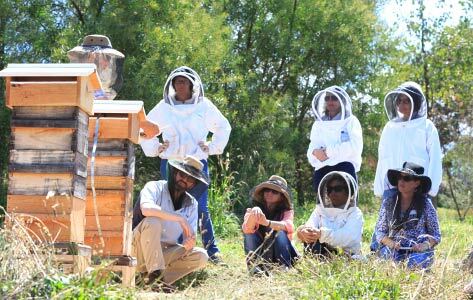 In addition to his beekeeping background, he also has many years of teaching experience and can communicate ideas and methods in an engaging, inclusive way. Please visit here for unsolicited testimonials and blog posts about the course by our students. Milkwood have been conducting post-course surveys since 2012 and this course has received 100% positive feedback from hundreds of students, with all attendees being ‘extremely satisfied’ with the course. Please visit Milkwood Permaculture for more information and online bookings. Sign up to our Newsletter if you wish to receive bi-annual updates about these courses and our work with Natural Beekeeping.